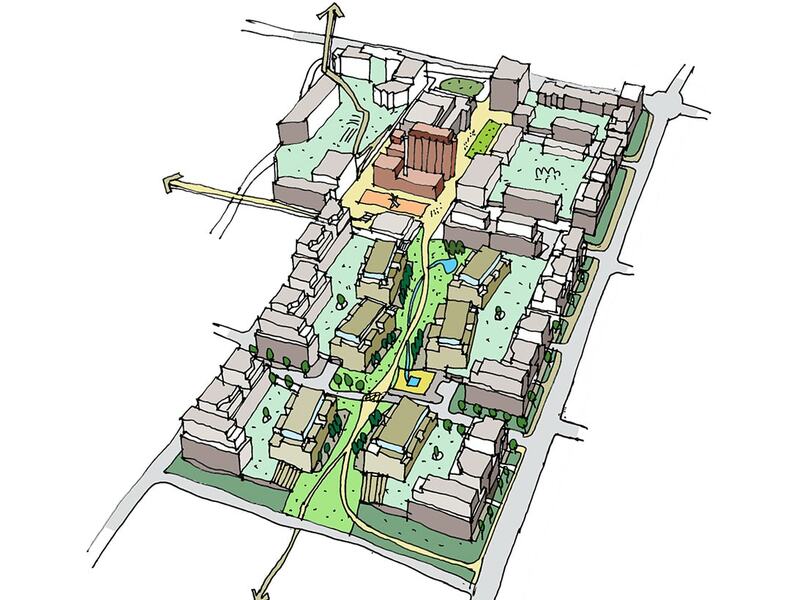 Developing a residential-led mixed use masterplan - enhancing viability and creating a sustainable development model. Our approach was to embrace the existing proposals whilst focusing on areas where we saw scope to increase the number of homes and to potentially improve the final development with a high quality urban realm. Our baseline was to use the envelope defined by the parameter plans to assess a more intense unit mix. This approach sub divided phase 2 into 6 blocks. We considered subdivision into various block sizes to assess the potential for these approaches. Analysis suggested a solution that provided scope for improved parking thus supporting increased unit numbers whilst also enhancing the key urban principles established by the parameter plans, to give the developer a holistic vision of the final scheme.